This is a healthier version of Persian Eggplant Dip (Kashkeh Bademjoon) which uses baked eggplant and not fried. But don’t worry – it certainly does not skimp in flavor! When I go to parties, I always find myself grazing at the appetizer table. I love tasting all the small bites and enjoy the selection of textures and flavors. I typically eat more appetizers and have no appetite for the impending main course. This is equally true with the Persian mezze, or appetizer spread: feta with fresh herbs, lavash, hummus, Persian Eggplant Dip (Kashkeh Bademjoon), beef cutlets and Persian Yogurt with Cucumber (Mast-o Khiar), to name a few. I love them all. Kashkeh bademjoon is made with cooked eggplant that is then mashed up. Because the eggplant is mashed up, it doesn’t matter which type of eggplant you use for this dish. The larger eggplants have more water and are less firm than the smaller varieties, but the smaller varieties are harder to find and are more expensive. When I am making my Persian eggplant stew (khoresh bademjan) or even my eggplant parmesan sandwich, I prefer to use the smaller, firmer eggplants. In those dishes, you don’t want your eggplant to fall apart or turn to mush. But for kashkeh bademjoon, you can easily use the cheaper and larger eggplants. I learned about this dish from my uncle, when I was living in Tucson attending the University of Arizone, where he is a professor. I frequently spent the weekends with my aunt and uncle and fill up on their delicious cooking. When my uncle would made this dish, he always fried the eggplant. Anyone who has fried eggplant knows that eggplant soaks up a lot of oil, and you can easily use over 1/2-cup of oil in the process. My husband likes to bake the eggplant whole. This is easy enough, you prick it several times with a fork and then bake it for 30-45 minutes, depending on how large the eggplant is. Be sure to prick the eggplant with a fork, though, because you don’t want it to explode when baking (speaking from hubby’s experience). I don’t like this method because the eggplant gets really watery, and so does the flavor. Whether I am making kashkeh bademjoon or khoresh bademjan, I like to to slice and bake the eggplant. But first I salt the eggplant slices and let it sit. This step removes all of that water inside the eggplant. 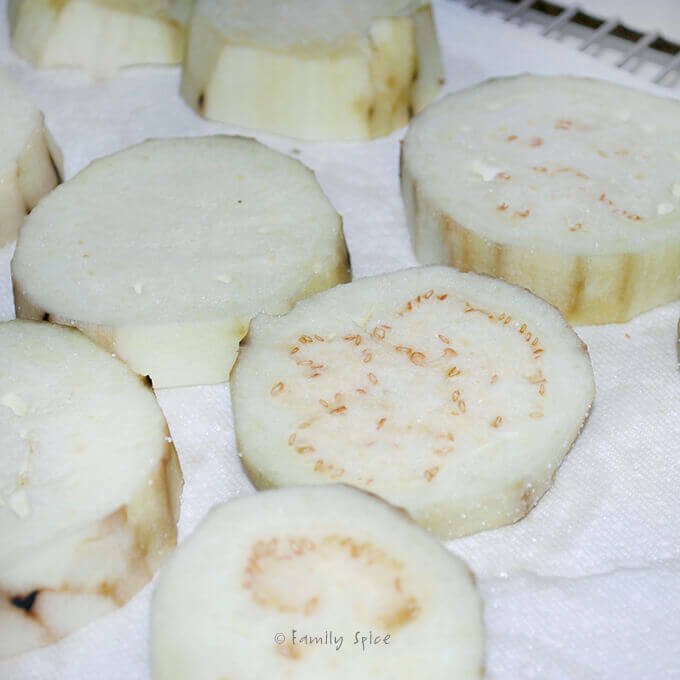 Salt both sides of your eggplant slices and place between sheets of paper towel. Then place a tray filled with heavy items like canisters or canned food, to help press out the water. Then let it sit for at least an hour. Your paper towels will fill up with water, but press the eggplant again in paper towels before coating both sides with olive oil and baking in the oven. 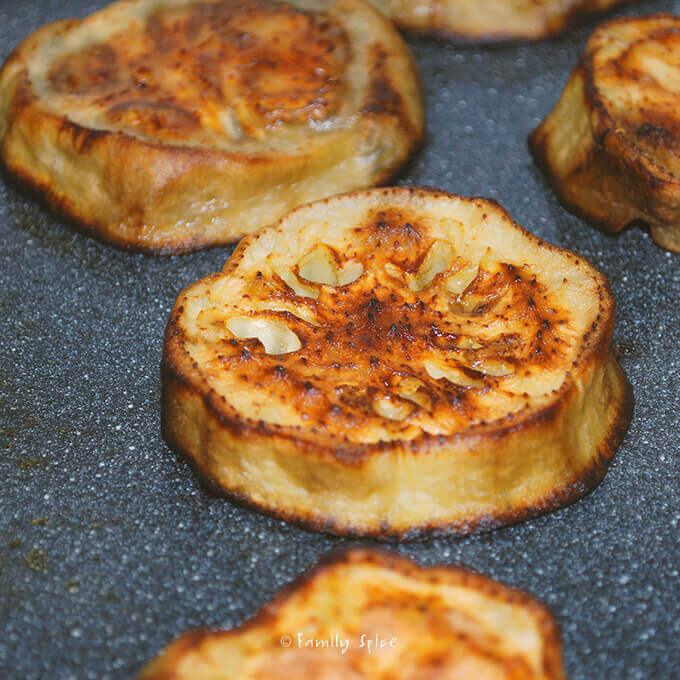 My method of baking the eggplant caramelizes and browns the eggplant, bringing out it’s beautiful flavor, and using less oil. Kashk is basically fermented yogurt with much of the liquid evaporated off. You can make kashk at home, buy kashk on amazon or buy it from a middle eastern market. 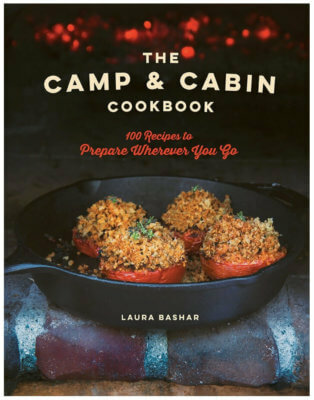 If you can’t find it, you can substitute kashk with sour cream or creme fraiche. 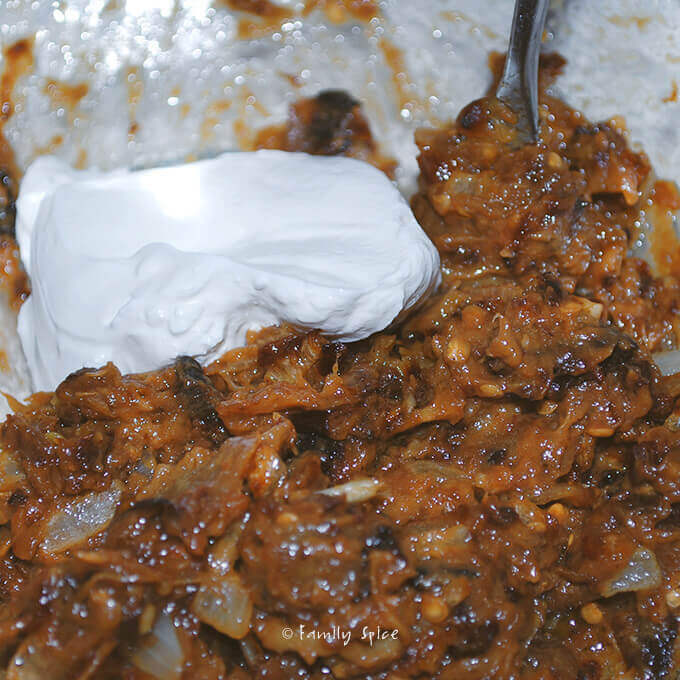 The flavor of kashk is a little more sour than sour cream. Either choices can be used for this dish. 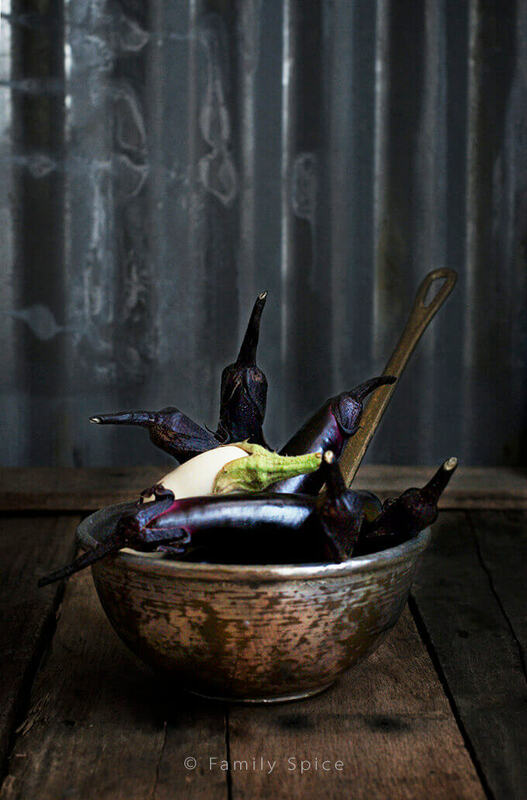 Garnishing your Persian eggplant dip, much like garnishing any Persian dish, is up to he (or she) who prepares it. 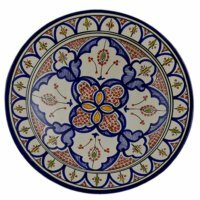 Persians take a lot of pride on presentation, so many dishes are garnished to artistic mastery. Kashkeh bademjoon is typically garnished with caramelized onions and some dried mint heated up in extra virgin oil. Kashkeh bademjoon is a classic Persian appetizer that is incredibly full of flavor. So think of the the Persian mezze as the Spanish version of tapas. And enjoy – noosheh jan! 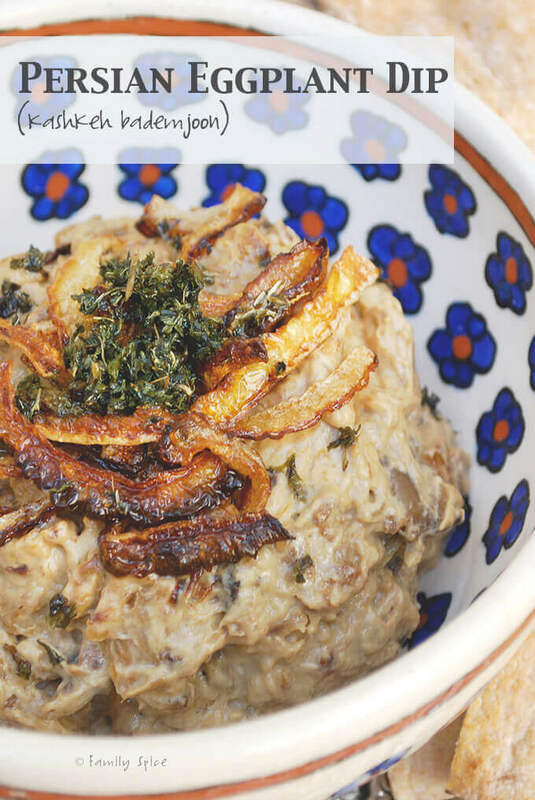 This is a healthier version of Persian Eggplant Dip (Kashkeh Bademjoon) which uses baked eggplant and not fried. But don't worry - it certainly does not skimp on flavor! Peel and cut eggplant into circles approximately 1-inch thick. Cover a cooling rack with two sheets of paper towels then place sliced eggplant on the towels and sprinkle with 1 tsp salt. Turn eggplant slices over and sprinkle with another 1 tsp salt. Cover eggplant with two more sheets of paper towels and place a baking sheet over the eggplant. Place some heavy objects, like books, on top of the baking sheet. 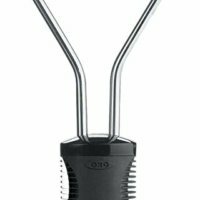 This will help squeeze out the excess water. Let the eggplant sit like this for 1 hour. Remove the weights off the eggplant and pat each slice with paper towel to remove extra water. 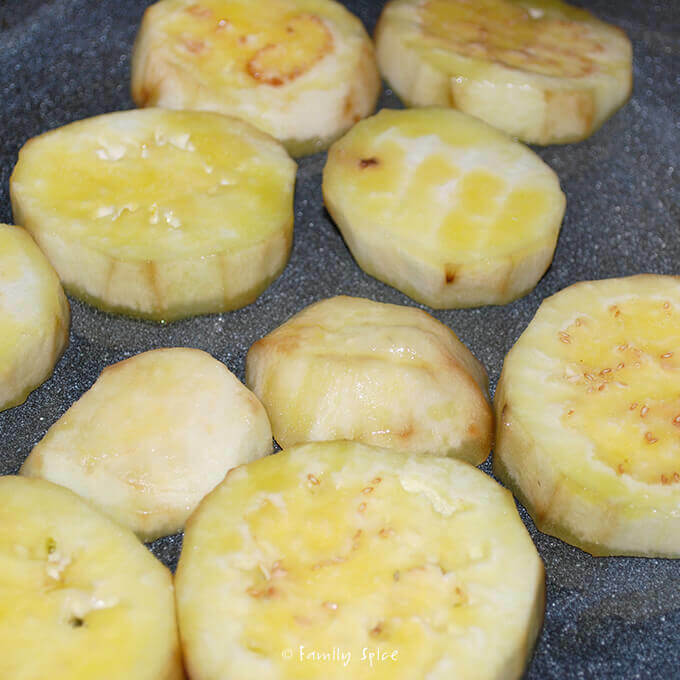 In a single layer, place eggplant slices onto a baking sheet. Rub both sides of the eggplant slices with 3 TBS olive oil. Bake for 20 minutes and turn eggplant slices over. They should be browned on the bottom and bake for an additional 15 minutes. Place eggplant in a large bowl and allow to cool to room temperature. Heat a large frying pan over medium-high heat and add 1 TBS olive oil. Add chopped onions to the hot oil. When onions start to soften, reduce heat to low and cook until onions brown and caramelize, about 20 minutes. Mix in garlic cloves and cook for 2 minutes then turn off the heat. Reserve 1 tablespoon of the caramelized onions. Add onions (leaving oil in pan) to the reserved eggplant and mash with a fork or hand blender. Stir in kashk (or sour cream) along with ground black pepper. Transfer and spread eggplant mixture evenly into serving dish. In the warm frying pan add dried mint to remaining oil. Heat oil until mint darkens, but do not burn. Sprinkle the oil and mint over the onion garnish. 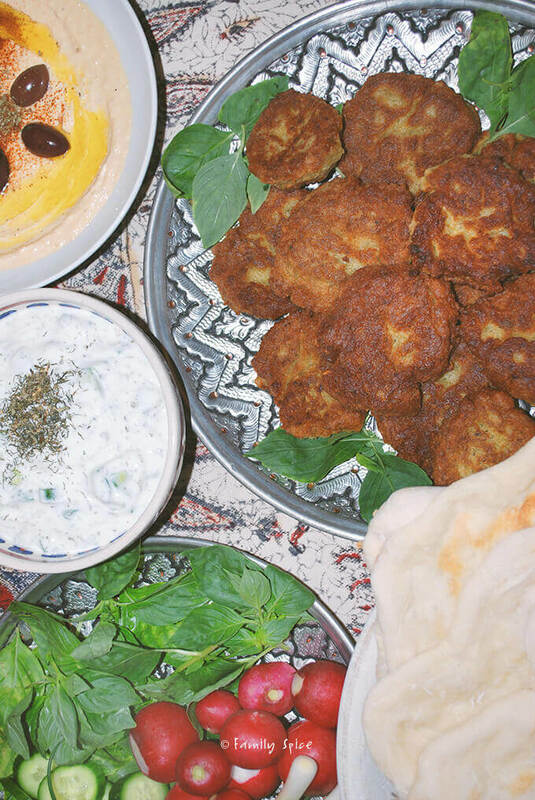 Serve with pita bread, chips and/or an assortment of vegetable. 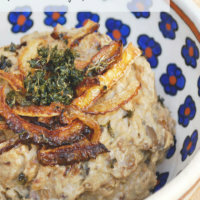 Similar to babaganoush, which is made with tahini sauce, kashkeh bademjoon uses whey (kashk). Whey is the liquid that has been strained from cheese or yogurt during the cooking process. 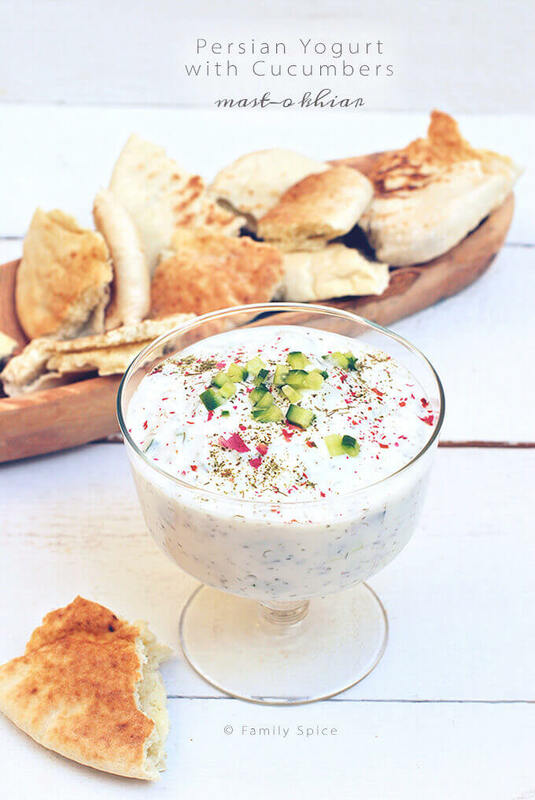 Kashk can be found in Persian specialty stores, or you can substitute it and use sour cream or creme fraische. I just learned of Daring Cooks today! How ironic! I am awaiting my status until March 15th. Nonetheless, your Mezze looks fabulous, and reminds me that Spring is on the way. Thanks for sharing! 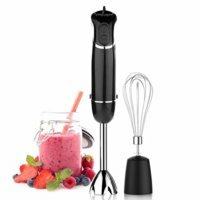 I'm glad you are joining Daring Cooks! It really does help you branch out and try new things. Can't wait to see what you come up with! You are very thoughtful! Your mezze turned out so beautifully! I was really upset that I couldn't get this challenge right. And I will use this 'failure' as a lesson to help me with the next challenge. Bring on March's challenge! Well not every challenge can be a gold medal – but sometimes you get more from the silver and bronze medal efforts. As a cook and baker sometimes I get more rewards from a 'failure' since it makes you learn more. Cheers from Audax in Sydney Australia. I LOVE hummus, especially the Mediterranean ones at Trader Joe's. Only my little girls and I love them in my family, my husband and son prefer spinach dip. What a great recipe! Hummus is very healthy and I found out about it while shopping at Trader Joe's. They were giving out free samples. This is definitely a keeper recipe for me!